Two weeks after undergoing surgery to repair a torn meniscus, Steelers quarterback Ben Roethlisberger returned to the starting lineup today against the Ravens. 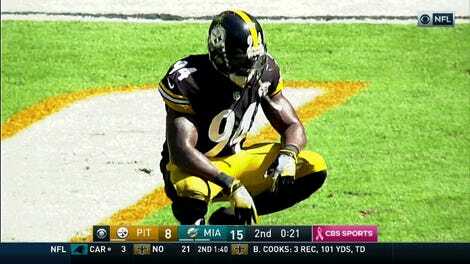 It did not help, as Pittsburgh turned in an ugly 21-14 loss. The team’s problems weren’t only with Roethlisberger, as Pittsburgh struggled in just about every way in the first half. The Steelers had 66 yards of offense in the first two quarters, with 50 of those coming from Roethlisberger’s 7-of-14 passing, and the remainder from a lethargic running game. The team achieved the dubious honor of more flags (eight) than first downs (two) and more penalty yards (70) than total yards (66). The Steelers somehow made the game competitive in the fourth. Roethlisberger connected with Antonio Brown for a 23-yard touchdown pass to make it 21-7, and followed it up with a four-yard rushing TD to put the Steelers within a score with less than two minutes to go. 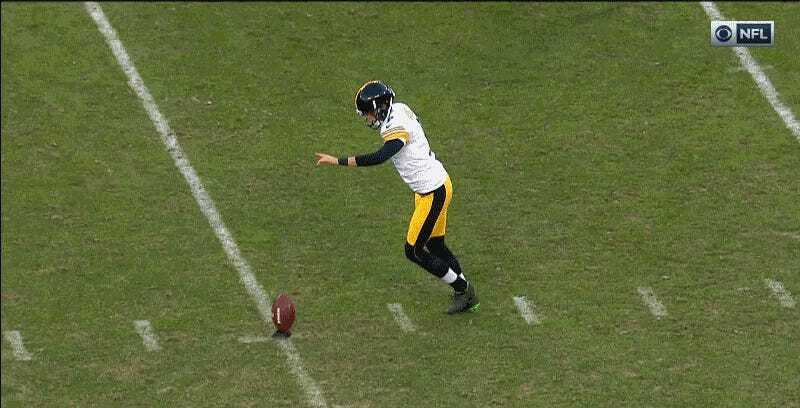 Boswell’s botched kick wasn’t the reason the Steelers lost, but it succinctly sums up the team’s overall performance today.